I picked this up around 2002 at a record shop in central London called Selectadisc. This came in a blank sleeve and as you can see from the shots of the vinyl, this is likely to have been a low budget release that probably only saw a limited number of pressings. This is affirmed by the fact that this 12” does not even appear on Premier’s Discogs and by the fact that I can find absolutely nothing about it on the internet. ‘Check My Style’ is undoubtedly the better of the two cuts, with a relatively classic Premier sound featuring a chilled piano loop, heavy beats and little else. I am not really that keen on the b-side and to be honest, it doesn’t even really sound like Premier production. 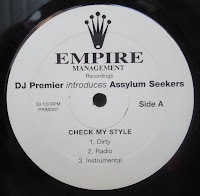 Lyrically, the Assylum Seekers are by no means awful, but there really isn’t that much to grab you here and ultimately although they do the beat justice, the real star of this release is of course Premier’s work on the boards. If anyone has any information on this then I would greatly appreciate it, and if you didn’t know that this existed then show some love and drop a comment: I suspect that this may be a blog exclusive. The next 12” for today is definitely less rare, as it features on the ‘Fatbeats: Volume 2’ collection released in 2002 and features two veterans of the game, Just-Ice and Big Daddy Kane. 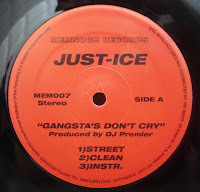 I find the a-side a little unispiring, a simple bass hook and drums with Just-Ice ripping verses over the top. To be honest, this feels a little like one of those beats that Primo probably puts together in his sleep, and as such it feels relatively mediocre. The b-side is my preferred cut on this 12”; the beat has a better vibe to it and the appearance of BDK provides the song with a little variation that serves the song well. Overall, this is a decent enough release but it is by no means the best work that any of the three artists who feature on it have ever produced. Still, for all you Premier junkies out there, this is a worthy addition to your collection.